The Washington State Fruit Commission made my day again early this month, when a big box of fragrant, juicy peaches and nectarines was delivered to my front porch. The fruit was so tasty that I made small batches of plain peach jam and raspberry-peach jam and then, with my husband’s help, simply devoured the rest. 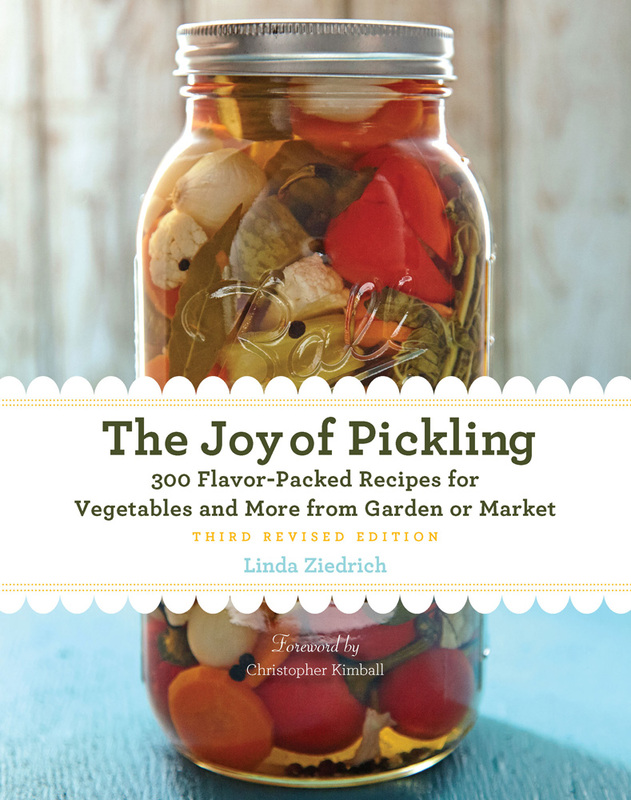 But I had promised the Fruit Commission a blog post, so I bought some locally grown, almost equally delicious peaches to make Spicy Pickled Peach Slices, one of the fifty-some new pickles in the third edition of The Joy of Pickling. Whole pickled peaches are a treat at holiday meals, but most commercially grown peaches are too big to fit into mason jars. Even if I could buy extra-wide-mouthed jars, I wouldn’t want to serve whole fruits as big as a newborn’s head. Sliced peaches are not only easier to pack into jars; they are also easier to eat with a fork than are whole peaches. With the sweetness, spice, and tang of a good barbecue sauce or chutney, and striking good looks to boot, this pickle is an excellent accompaniment to smoked and grilled meats. Try it over ice cream, too. Put the cinnamon, mace or nutmeg, cloves, slivered gingerroot, vinegar, and sugar into a saucepan. Bring the liquid to a boil, stirring to dissolve the sugar, and then immediately reduce the heat to a simmer. Simmer the syrup for 10 minutes. Divide the coriander, allspice, pepper flakes ginger slices, and salt among four pint mason jars. In a pot of boiling water, blanch the peaches a few at a time until the skins loosen, about 30 to 60 seconds. Plunge the peaches into a bowl of cold water. When all the peaches are blanched, slide off their skins. Slice each peach into wedges about 1 inch wide at the widest point. Strain the syrup into a wide pan. Bring the syrup back to a simmer, and add the peach slices. Bring the mixture to a boil, and remove the pan from the heat. Ladle the peaches and syrup into the mason jars, leaving 1/2 inch headspace. Add two-piece lids, and process the jars in a boiling-water bath for 20 minutes. 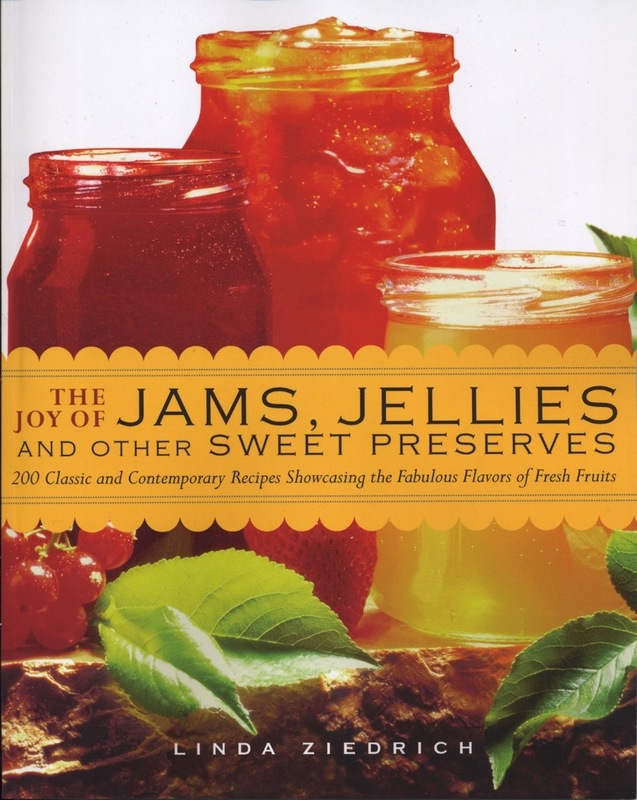 This entry was posted in Fruits, Pickles and tagged preserving, sweet pickles, Washington peaches. Bookmark the permalink. This sounds so tasty! How long do you think they would hold as refrigerator pickles, instead of putting them up? Chelsea, they should hold for months as refrigerator pickles. well I guess I’ll be picking up some peaches at my Farmers’ Market, then! Thanks, Linda. Great post, thanks for this! Looking forward to the new book. Will order it this week. I’ve seen some people saying they prefer clingstone peaches because they can up firmer; do you put any store in that? I’d never heard that, Randal. Do these people cut out the stones, or do they always can their peaches whole? Yum–These look great! I already have the new book, and have paged through it, but I haven’t had a chance to look at the new recipes yet. I want to transfer my notes from the last edition too, so excited! I just discovered your blog after reading a post via Bikrgurl. I wish I lived near you. Do you sell your canned confections? They sound delicious, especially these peaches! Thanks for asking. I used to sell some pickles and preserves locally, but since selling the farm I’ve stopped. I always wished I could grow fruits or vegetables without the animals getting to them. Now I really wish I could, so that I can try these recipes. I wish I could grow fruits and vegetables without the animals getting to them, just so that I can try these recipes.